A report by Transparency Market Research observes that the global CCTV camera market is seeing consolidation on account of players banking upon mergers and acquisitions to bolster their positions. Competition in the market is stiff on account of numerous hardware and software providers. Most of the prominent players in the market are concentrating on unveiling upgraded and sophisticated systems and solutions in the CCTV camera market in order to up sales. The mushrooming modern retail outlets and a booming hospitality industry are serving to provide a major impetus to the global CCTV camera market. Besides, continued progress in technology on account of players expending money on product development is also having a positive impact on the market. As per Transparency Market Research, the global CCTV camera market is expected to expand at robust 12.7% CAGR during the period between 2017 and 2025 to become worth US$23.32 bn by 2025. The global CCTV camera market can be segmented depending upon the type of model into PTZ camera, box camera, dome camera, bullet camera, etc. Of them, the segment of dome camera leads the market and in 2016 its leading share came to about 45%. The segment is expected to grow at a healthy clip in the years ahead as well on account of further investments in it and on the back of technological progress. Depending upon the type of technology, analog CCTV camera systems accounted for maximum market share in 2016. The other types of technology leveraged in the making of CCTV cameras are wireless CCTV systems, IP-based CCTV systems, and hybrid CCTV systems. From a geographical standpoint, the global CCTV camera market is dominated by North America and Asia Pacific. Currently, Asia Pacific market is being powered by China which manufactures cheaper varieties of the product that are seeing widespread uptake. India is another key market in the region vis-à-vis demand. As per the TMR report, the market in Asia Pacific will likely outpace all other regions in terms of growth rate by registering a CAGR of 14.6% from 2017 to 2025 to become worth US$9.554 bn by 2025. North America is another prominent market which has been seeing soaring sales of CCTV cameras on account of a major thrust on public security. Terrorist attacks in the past and other security issues threatening to undermine the peaceful lives of people has resulted in enormous adoption of CCTV cameras for surveillance. Other factors serving to boost the market in the region is the investments into research and development of better products with more sophisticated technologies. Regulatory policies too have supported the sales of CCTV cameras in the region, particularly in the U.S. The market in North America is projected to clock a 10.2% CAGR in the forecast period. 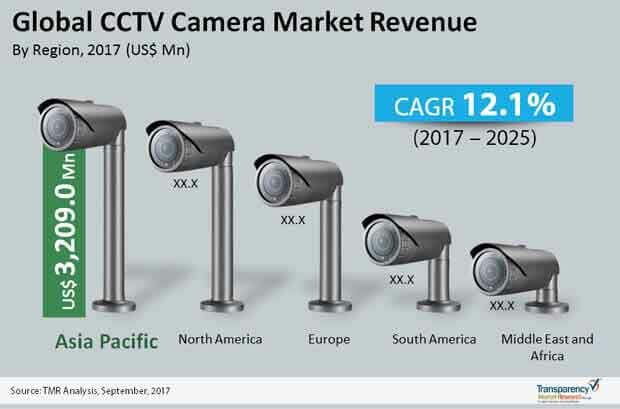 The Europe market for CCTV cameras has already seen large scale progress and the markets in the Middle East and Africa and South America are predicted to see a slower pace of growth as compared to other regions. Some of the prominent participants in the global CCTV camera market are Axis Communications AB, Bosch Security Systems, Inc., Geovision Inc, Hangzhou Hikvision Digital Technology Co Ltd, Hanwha Techwin Co. Ltd, Honeywell International Inc., Panosonic System Network Co. Limited, Pelco Inc, Toshiba Corporation, and Zhejiang Dahau Technology Co. Ltd.
CCTV cameras offer a secure medium to monitor and record images and video. The demand for CCTV cameras for the purpose of surveillance has soared globally. This demand is attributed to the rising threat to public security due to criminal and terrorist attacks. Apart from public security surveillance CCTV cameras are used to monitor areas such as shopping malls, hotels, streets, banks, and government buildings. CCTV cameras vary on the basis of technology and model type. The CCTV camera market consists of a large number of software and hardware providers. The CCTV camera market value chain is characterized by system integrators and service providers. The CCTV camera market is highly competitive since it has a large number of hardware, software, and technology providers. Intense competition in the market affects the pricing strategy adopted by the players in the CCTV market. Investments in research and development initiatives is largely prevalent in the CCTV camera market. Based on geographical regions, the report segments the global CCTV camera market into North America, Europe, Asia Pacific, Middle East & Africa (MEA), and South America, which are analyzed in terms of revenue generation. The report provides country level revenue for CCTV camera market. The U.S., Canada, the U.K., Germany, France, India, China, Japan, GCC, South Africa, Brazil, and Argentina are the countries covered in the report. The report also provides the country level data of each of the market segments for all the countries mentioned above. North America is expected to lead the CCTV camera market during the forecast period. The region houses a large number of CCTV camera system and solution providers. The Asia Pacific region is expected to witness the highest growth rate of 14.6 percent during the forecast period. The Middle East and Africa and South America are in the early phases of large scale installation of CCTV cameras. The anticipated growth of tourism sector of the Middle East and Brazil is expected to support the market growth of the CCTV camera market of these regions during the forecast period. The CCTV camera market comprises large number of medium and large players. Product innovation, mergers and acquisition, and research & development investments are the key growth strategies adopted by the players in the CCTV camera market. The market is expected to be hit by a huge wave of mergers and acquisitions in the coming years. This research report provides an in-depth analysis of the global CCTV camera market based on model type, technology, end-use application, and geography. The global CCTV camera market is categorized based on model type into PTZ camera, box camera, dome camera, bullet camera, and others (hybrid, etc.). The technology segment for the global CCTV camera market consists of analog CCTV systems, wireless CCTV systems, IP-based CCTV systems, and hybrid CCTV systems. The end-use segment is classified into retail, hospitality, BFSI, home security, government, and others (transportation, healthcare, etc.). The report analyzes each of these segments for the various geographies considered under the scope of the study. The report includes analysis of the factors that drive and restrain the growth of the CCTV camera market. It discusses the prevailing market trends and prospective growth opportunities in the global CCTV camera market. It provides market estimates and forecasts for all the segments in terms of revenue. Also provided in the report is the market positioning of the companies in the CCTV camera market. Major business strategies adopted by key players, their SWOT analysis, and competition matrix has also been identified in the research report. Axis Communications AB, Bosch Security Systems, Inc., Geovision Inc, Hangzhou Hikvision Digital Technology Co Ltd, Hanwha Techwin Co. Ltd, Honeywell International Inc., Panosonic System Network Co. Limited, Pelco Inc, Toshiba Corporation, and Zhejiang Dahau Technology Co. Ltd. are major players profiled in the global CCTV camera market report.